Sandal Foot is based out of Polk County Florida. 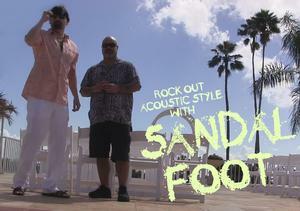 Guitarist/vocalist Dave Gandia, and bassist/vocalist Steve Kluesener, make up this acoustic duo. They play popular music by artists such as Bruno Mars, Billy Idol, Darius Rucker, The Rolling Stones, U2, and many others.